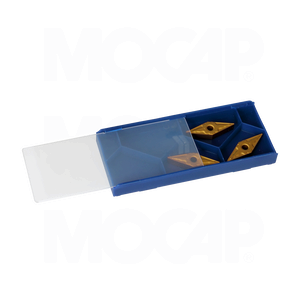 Insert Boxes are the ideal packaging solution for high quality carbide blade inserts as well as any small delicate set of items that require individual compartmental storage. Transparent lid offers secure center locking position with quick, simple sliding opening/closing in either direction. Optional custom cut foam inserts are available to provide extra protection for ceramic, diamond and delicate inserts. The Insert Boxes conveniently lock together when stacked and are re-useable. Insert Boxes are handy packaging options for industries such as fishing, hunting, hobby, craft, hardware, office supplies, medical, dental and many more. Our Insert Boxes are available in natural or coloured Polypropylene (PP) and is 100% recyclable. Custom colours available.